Saint Jerome during a serious illness received a vision in which Christ judged him. Deeply affected, he retreated to the wilderness for four years and while in the desert, undergoing austere penance, he studied Hebrew. He returned, was ordained as a priest and spent the next seventeen years in Rome criticizing the Church society. He moved to Antioch in 385 and while there, translated the Old Testament from Hebrew into Latin. Considered to be one of the four great doctors of the Church, Saint Jerome is always depicted in retablo art as a hermit in the wilderness. Accompanying him are the symbols of penance and contemplation: the scourge, skull and crucifix. He is often shown with a wounded chest, due to his beating his chest with a rock while he was a hermit, symbolizing his rejection of temptations of the flesh. He is dressed in a red robe, symbolizing the misunderstanding of being known as a cardinal for his services for Pope Saint Damascus. In addition, a horn is seen in an upper corner signifying the final trumpet call. In this piece he is shown with a book, testifying to his scholarship. A lion is also associated with Jerome. It is thought that the lion was transferred to him because of confusion with Saint Gerasimus. The Latin spelling of Jerome, Geronimus, was so similar to that of Saint Gerasimus that Jerome acquired from Gerasimus the lion and the tradition of removing the thorn from its paw and in turn gaining the lion’s loyalty. 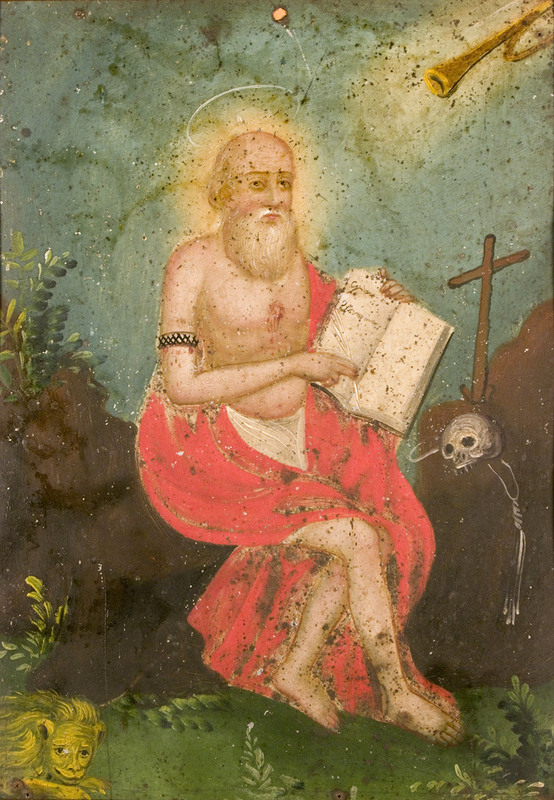 Saint Jerome is sought out for protection against temptation and want. He is the patron saint of scholars, philosophers and librarians.